Background: B-cell epitope prediction is an essential tool for a variety of immunological studies. For identifying such epitopes, several computational predictors have been proposed in the past 10 years. 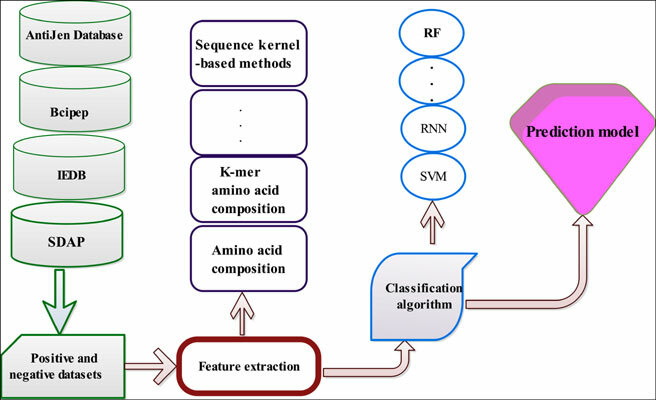 Objective: In this review, we summarized the representative computational approaches developed for the identification of linear B-cell epitopes. Methods: We mainly discuss the datasets, feature extraction methods and classification methods used in the previous work. Results: The performance of the existing methods was not very satisfying, and so more effective approaches should be proposed by considering the structural information of proteins. Conclusion: We consider existing challenges and future perspectives for developing reliable methods for predicting linear B-cell epitopes. Keywords: linear B-cell epitopes, machine learning, bioinformatics, computational, immunological, feature extraction. Keywords:linear B-cell epitopes, machine learning, bioinformatics, computational, immunological, feature extraction. Abstract:Background: B-cell epitope prediction is an essential tool for a variety of immunological studies. For identifying such epitopes, several computational predictors have been proposed in the past 10 years.